Your favorite superheroes and villains shrink down for the Funko Avengers Infinity War Mystery Minis bobble-heads. The blind-box set packs a deep Marvel lineup filled with exclusives. 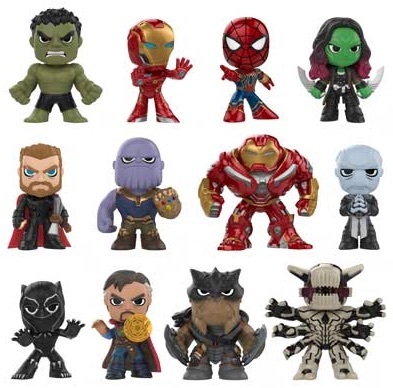 The distinct Mystery Minis look is applied to the stars of Avengers: Infinity War, including many options found in the Pop! set, such as Hulk, Iron Man and Thor. Issued with varying figure odds, completing the full Funko Avengers Infinity War Mystery Minis collection is more difficult because there are four different formats. 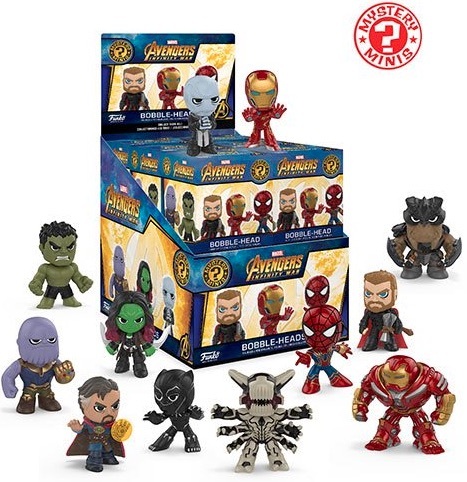 Buy Avengers: Infinity War Mystery Minis on Entertainment Earth. Each format contains 12 total figures, with Cull Obsidian, Dr. Stange and an Outrider only available in the main version. Captain America, Proxima Midnight and Winter Solider come in Hot Topic boxes, while Corvus Glaive, Falcon and Iron Man (with repulsor cannon) are exclusive to Walmart. Rounding out the Marvel set, Black Widow, Teen Groot and Vision are only waiting in Target boxes. Because the Funko Avengers Infinity War Mystery Minis figures have different rarity and three sets of exclusives, obtaining the full lineup is equal parts luck and perseverance. The following gallery showcases all the choices, with a complete checklist and known box odds below that. Shop for Funko Avengers Infinity War Mystery Minis figures on eBay.